Recommended for readers who enjoy family sagas spanning generations. 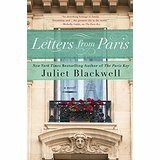 Blackwell (The Paris Key) has woven a great tale of mystery, artistry, history, and a little romance. With plenty of backstory and tidbits about Parisian life in the 19th century, there's something for everyone in this recommended read. This is a solid contemporary fiction purchase, especially for Francophiles and those who enjoy Paris settings. Blackwell's third entry in this series (after Dead Bolt) is a charming cozy. This top-notch light paranormal successfully mixes San Francisco history with a tremendously appealing ghost buster at the helm.